Sodium tripolyphosphate, a condensed phosphate applied in various industries, can be produced according to a new dry single-stage method or a classic spray drying two-stage method. To compare variants of sodium tripolyphosphate production, three multi-criteria methods (Borda, compromise programming and analytical hierarchy process) were applied. Assessment criteria of individual—best available technologies not entailing excessive costs options of sodium tripolyphosphate production and complex quality assessment calculation results allowed for the determination of a decision matrix for a choice of sodium tripolyphosphate production technology based on the applied decision methods. Applying the above methods allowed for ordering of the variants of tripolyphosphate production from the most to the least advantageous. The use of various criteria types (technological options and indices for complex quality assessment) as evaluation criteria in multi-criteria analysis allowed for an independent evaluation of the technology. Calculations from Borda and compromise programming methods showed that, in all cases, the assessment criteria used reached the highest possible level for dry single-stage technology for sodium tripolyphosphate production. Results obtained by analytical hierarchy process method confirmed the conclusions from Borda and compromise programming methods. Ranking of the developed technological solutions indicated the dry single-stage method of sodium tripolyphosphate production to be the advantageous technological variant. Sodium tripolyphosphate Na5P3O10 (STPP) is a condensed phosphate that plays an essential role, mostly in the synthetic detergent sector. It is the main component of detergents in laundering and dishwashing (industrial, institutional, and domestic). STPP applied as a filling material and supplemented with surfactants acts as a very efficient detergent. Sodium tripolyphosphate has been applied as a dispersing agent in ceramic processing and can also be used as an inexpensive plasticizer in cement-based materials (Goberis et al. 2005; Ltifi et al. 2011; Tan et al. 2014). STPP finds applications in the food industry as an additive to meat products (Owen and Will 1992; Aksu and Alp 2012), as an additive to seafood (Gonçalves and Ribeiro 2008), and as a conservation agent of foodstuffs, for example, fruit juice or milk. With an increase in STPP applications in industry, there is also an increase in demand for it, and the global sodium tripolyphosphate market is expected to increase up to 8.1 billion USD in 2022 (Market Research Future 2017). About 70% of the total demand for STPP has been recorded in Asia–Pacific, European, and Latin American countries (Global Industry Analysts Inc. 2017). Production of sodium tripolyphosphate can be carried out by two technological variants: dry single-stage and classic spray methods. Sorting and concentration of raw materials depend on the choice of the technological variant and on the quality requirements arising from its application (Makara and Kowalski 2013; Kowalski and Makara 2014). Impurities, present in raw materials, may accelerate or retard the progress of the total technological process or affect some its stages. The effect of impurities on the phase composition of STPP depends on the type of impurity, concentration of phosphoric acid, and calcining temperature (Kijkowska et al. 2007; Makara et al. 2011). The formation of anhydrous Na5P3O10 begins within a temperature range of 200–250 °C. The rate of reaction increases with the temperature. Depending on the heating (calcining) temperature, STPP appears in one of the anhydrous monoclinic forms: low-temperature Na5P3O10-II (Form-II), below 400 °C, or high-temperature Na5P3O10-I (Form-I). The phase transition, a process that is complex and not entirely described in the literature, has been observed in a wide (450–500 °C) temperature range. This transformation is usually not complete, and it is commonly found that STPP heated above 500 °C contains a small percentage of low-temperature Form-II (Van Wazer 1958). Form-I and Form-II content in STPP may be regulated through a suitable choice of calcining temperature, resulting in a final product with a predominant amount of Form-I or Form-II. It is very difficult to obtain Form-I or Form-II as a single phase without contamination by at least few percent of the other STPP form or by other phosphates (Van Wazer 1958; Toy 1973). Multi-criteria analysis is a method that indicates points in the decision-making process allowing for the choice of a technological solution. Criteria that include as many aspects of the technological process as possible have to be preliminary defined (Maxim 2014; Govindan et al. 2015; Matzen et al. 2015). Criteria on the basis of which the decision is made to choose a particular variant of technology are treated as a starting point in multi-criteria analysis. This analysis is performed by different methods that enable the most advantageous solution, which can be the most unique, rational, and/or effective (Zopounidis and Doumpos 2002; Løken 2007; Kahraman 2008). Multi-criteria analysis has been applied to different areas of activity, particularly in environmental protection (Linkov et al. 2006; Huang et al. 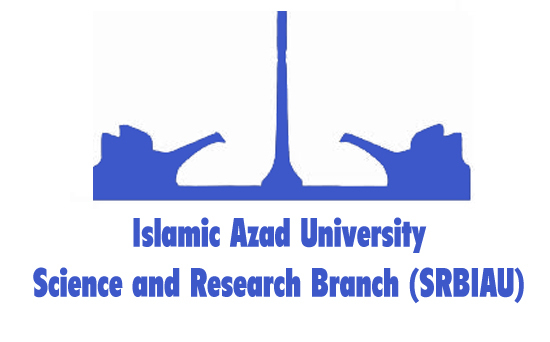 2011; Mardani et al. 2015; Gaska and Generowicz 2017). In this work, multi-criteria analysis was applied in order to choose the most advantageous technological variant of sodium tripolyphosphate STPP production. Multi-criteria analysis, using an assessment of particular BATNEEC (best available technologies not entailing excessive costs) options and complex quality assessment indices as the criteria of STPP production, made it possible to write a decision matrix for the choice of technology using the following decision methods: Borda, compromise programming, and AHP. The research was conducted in the years 2013–2016, within the framework of collaboration between the Cracow University of Technology and Energy Economy Research Institute of the Polish Academy of Sciences Kraków. In the classic spray method, STPP is obtained by a multistage process of dehydration of a phosphate mixture equivalent to a molar Na2O/P2O5 ratio of 5:3. Production consists of phosphoric acid neutralization (wet process) and heating (dry process). In the wet process, phosphoric acid (thermal or purified “extraction” phosphoric acid) is neutralized with sodium hydroxide or carbonate in an amount necessary to obtain a solution of orthophosphates with a molar Na2O/P2O5 ratio of 5:3. The solution so obtained undergoes dehydration through a spray drying method. 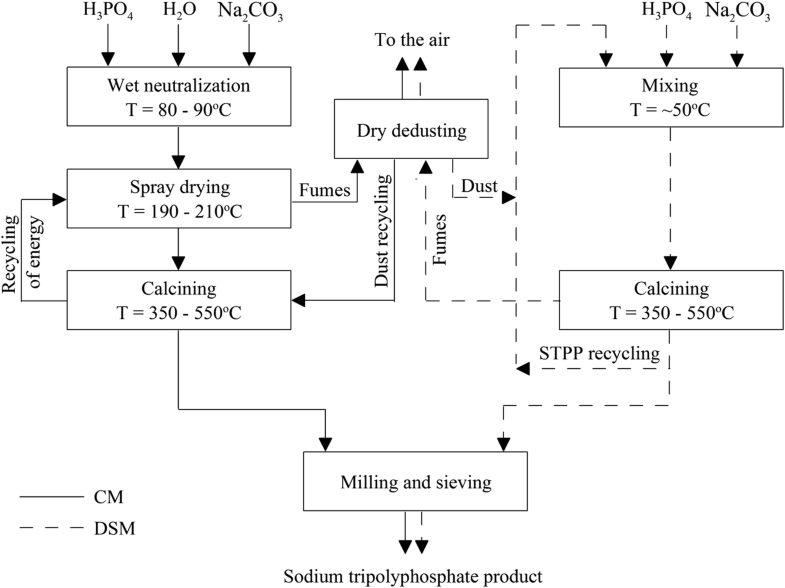 In the dry process, the dehydrated mixture of phosphates is calcined in a rotary kiln to obtain the final product of sodium tripolyphosphate (Na5P3O10). The product undergoes milling, sieving, and packing. Combustion gas from a rotary kiln passes through a dedusting bag filter, and then is recycled into the process. The classic spray method requires more energy for drying and calcining of phosphates. Higher energy consumption arises from the necessity of using diluted phosphoric acid in the neutralization process (Makara et al. 2016). In the dry, single-stage method, concentrated phosphoric acid (~ 75% H3PO4) is neutralized with sodium carbonate, then some proportion of the final STPP-product is recycled and the mixture obtained is dried and calcined in a rotary kiln in a single technological operation. STPP recycling improves flow rate of the product and protects against agglomeration of the powder, and also facilitates the transport of the mixture into a rotary kiln, where the orthophosphates are condensed into pyrophosphates and converted into the final product of sodium tripolyphosphate. The dry, single-stage method, in which the expensive spray drying operation has been eliminated, is less expensive than the classic spray method (Kowalski and Makara 2014). 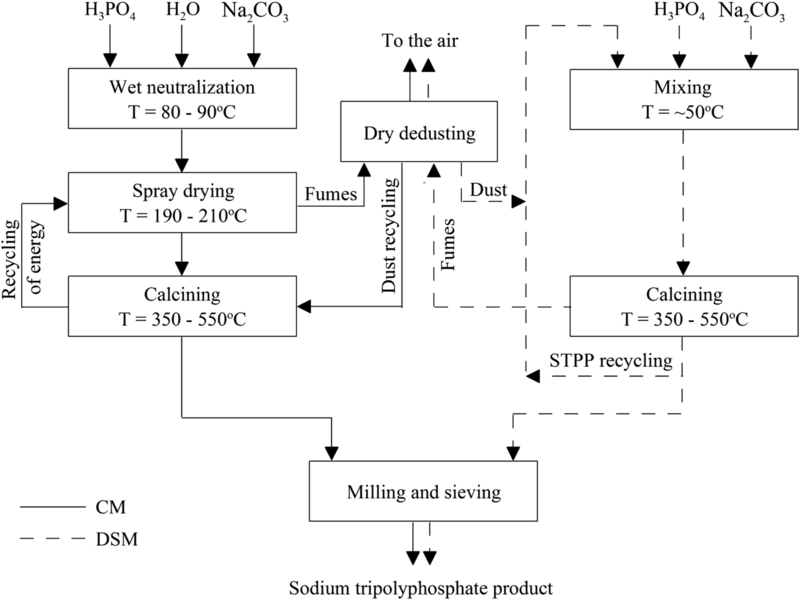 A technological diagram, where parameters of STPP production for dry single-stage and classic spray methods are specified, is presented in Fig. 1. The first method for the choice of criteria was BATNEEC. Using the BATNEEC method, two essential elements were subjected to assessment: first, accordance of the examined technology with the BAT (best available techniques) standard, indicating the best technical solution that guarantees the minimum environmental impact of hazardous materials; and, second, cost-effective production. The options under assessment underwent rating by experts. The scale of scoring was 0–10 points within each of the criteria (Table 1). The sum of the mean estimations of the criterion was used to make an assessment of the options (Kowalski 2001). The second method applied for comparative assessment of both analyzed methods of STPP production was a complex quality method qualitatively characterizing compared technologies. The aim here was to make a choice of the better one. The assessment of the complex quality of a substance (also a technology) comprises quality features (“n” could be any number). One resultant number can determine an entity characterized by numerous quality features (Kowalski and Makara 2017). Therefore, complex quality is a function of quality features. 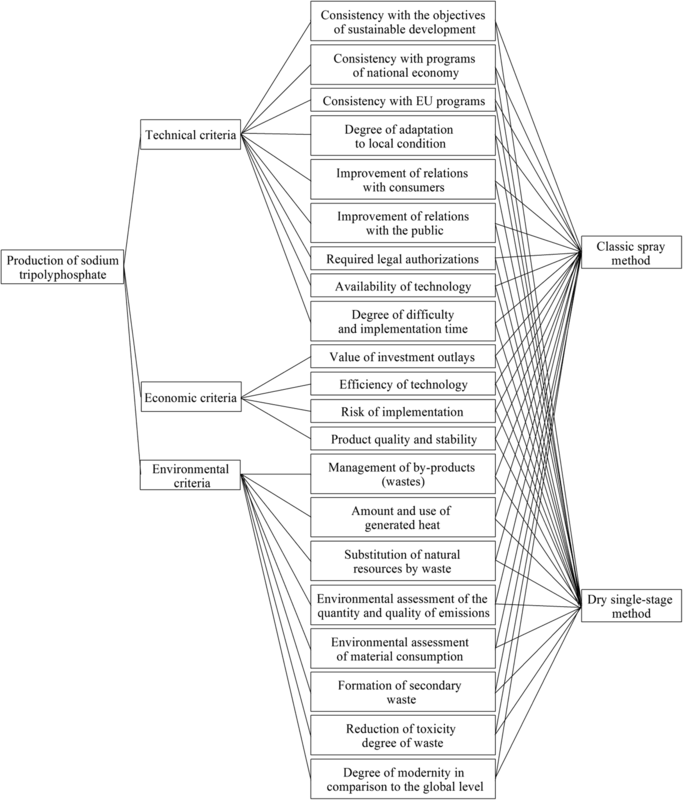 The assessment of technological quality comprised three steps of partial expert assessments; technical level, reduction degree of environmental hazards, and economics of the enterprise (Kowalski et al. 2012, 2015). Particular criteria assessing the level and efficiency of effects of a solution were classified as 0 (zero), 1 (low), 2 (medium), or 3 (high). The arithmetic mean of the points of the individual criterion resulted in its partial assessment. In turn, the arithmetic mean of the technical, environmental, and economic assessments resulted in a value of the complex quality of the technology. The rating of solutions qualified as advantageous should have amounted to more than 1.5 points. The final assessment was supplemented with a possibility of another competitive technology or an appearance of new equipment (0 or 1). where a1, a2, and a3 are degrees of validity, and W1 is the value of the technical assessment of the individual solution, W2 the value of the environmental assessment, W3 the value of the economic assessment, and Qmean the final assessment of the individual solution. The results of the technical, environmental, and economic assessments are presented in Table 2. The results of the assessment of the technical level of the analyzed proposals of the new technological solution (30 points) were significantly higher than the assessment of the classic technology variant (19 points). The environmental results of the newly proposed technological solution (27 points) were also higher than those of the classic method (16 points). The economic assessment of the discussed solutions gave results of 10.5 points for the classic method and 16 points for the dry single-stage method. The total assessment of the technological quality methods of STPP production showed that a higher rating was obtained in the case of the dry single-stage method (47.67 points). The classic method (29.33 points) was lower by about 40% than the dry single-stage one. These results indicate that high technical and economic progress may be achieved after the dry single-stage method is implemented in industrial practice (Kowalski and Makara 2017). The assessment of the two methods of STPP production is summarized in Table 2. 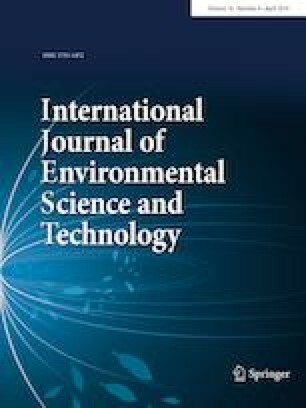 Results from the BATNEEC and complex quality assessment methods were used as a basis for multi-criteria analysis, in which the formulated tasks were in the form of tabulated numbers defining criteria that evaluated the level of realization of the assumed targets in different technological variants. The next essential step was a choice of the type of multi-criteria analysis method. Three methods of multi-criteria analysis have been applied (Generowicz et al. 2011a, b; Govindan et al. 2015; Gaska et al. 2017): the Borda method, the method of compromise programming, and the analytical hierarchy process (AHP). where Dnm is the position of the strategy sn in order according to the criterion rm, and Dn is the summary position of strategies based on all criteria. where sj, Dj, and Dn are “summary” positions of strategies based on all criteria, n = 1,…,N. where Lα(sn) is the distance of the examined strategy sn from the ideal point, s* the strategy chosen, wm the coefficient of the criterion m, xmʹ the coordinate of the utopian point m, rNMʹ the normalized value of the criterion, M the number of criteria, and α the exponent indicating deviation of the strategy from the utopian point xʹ (in practice, it is assumed to be 1, 2 or ∞). The application of the above multi-criteria analysis method, while additionally taking into account “weighting” criteria, gives a final solution of the decision task. The final result is in the form of ranking/ordering of the variants of the analyzed technology of STPP production from the most to the least advantageous solution. AHP (analytical hierarchy method) is a method in which preferences are evaluated using relative values based on significances of the criteria assessing the variants. Assessments arise from pair-wise comparisons of all the criteria on a certain hierarchical level. The analytical hierarchy process (Saaty 2001; Zopounidis and Doumpos 2002) enables the achievement ranking of many acceptable variant projects with regard to many non-equivalent criteria of the assessment. The final assessment is performed taking into account all criteria simultaneously. To facilitate calculations and comparisons, the hierarchical representation is often arranged as a “value/decision tree” built of all the variants and criteria. where n is the number of objects and aij an element of the matrix. where ω is the preferences, while particular matrix elements (criteria for variant assessment) are compared. where H is the formula of criteria aggregation (in a form to evaluate variants by all criteria simultaneously), Wi the decision variant with index (i), Kj the criterion with index (j), ωj the relative weight of criterion Kj, and Kj(Wi) the partial assessment of the Wi variant on Kj criterion. Multi-criteria analysis using an assessment of particular BATNEEC options and indices for complex quality assessment as criteria of STPP production makes it possible to write a decision matrix for the choice of technology according to the following decision methods: Borda, compromise programming, and AHP. The Borda method is the simplest one and gives a unique solution dependent only on criteria, and is not dependent on the preferences of a decision-maker. The method of compromise programming gives more complex results, as there is a possibility for “weighting” assignments for particular criteria. For application of the compromise programming method, it is necessary to make a hierarchy of the validity of the particular criteria, determining the priority of the participants in the decision process. At the beginning, ordering obtained with regard to the same “weightings” for all criteria are examined. Next, after a reasonable change in “weightings,” ordering is examined to find out whether there is a change, particularly at the beginning of the rank. If orderings so obtained are resistant to “weighting” changes, it can be assumed that preferences of the decision-making person will not affect the choice of variant. In the adverse case, it is necessary to engage the decision-maker in the decision process and make further investigations into their preferences. The results and final ranking of particular variants based on Borda and compromise programming with the use of assessment indices of BATNEEC options are presented in Table 3. In ordering with respect to compromise programming, solutions depending on the value of “weightings” assigned for individual criterion have been presented. In the last six rows (Table 3), the method of “weightings” assignment was additionally differentiated. The “weightings” were assigned for all the groups of criteria according to technical, economic, and environmental aspects. In the last row, “weightings” of criteria that had the same value in the assessment of two analyzed technologies were increased. That resulted from small differences in the description and the values of criteria differentiating the technologies. As a result, a ranking of technological variants of STPP production from the most to the least advantageous solution was obtained. The method makes it possible to get an additional “weighting” of the criteria by applying an exponent α. The exponent allows for the additional “weighting” of each deviation from the ideal point in proportion to its magnitude. The higher α value, the higher the significance of the deviation of the strategy is from the ideal point. Individual cases based on different α values are presented in Tables 3 and 4. In all cases (which is not typical), the technology of STPP production chosen as the most advantageous was dry single-stage technology (DSM), although, according to the BATNEEC assessment, classic and dry single-stage technologies were very close. In correspondence with that, in some calculated cases, the positions of the classic technology as well as those of dry single-stage method were very close to the utopian point. Those cases, characterized by close or identical values of both technological solutions, appeared after the value of the α coefficient was increased and “weighting” criteria were increased from 1 to 5. Nevertheless, it can be explicitly concluded that the most advantageous variant, according to both multi-criteria analyses, is the dry single-stage technology of STPP production. Results and final rankings of particular variants based on Borda and compromise programming with the use of indices of complex quality assessment as criteria are presented in Table 4. Calculated results of the complex quality assessment of the technological solutions taken from Table 2 constituted the decision matrix for multi-criteria analysis. Application of Borda and compromise programming methods allowed for ordering the variants of STPP production, from the most to the least advantageous technological solution. In these calculations and analyses, assumptions similar to the BATNEEC options were made. Ordering was examined by changing “weightings” of individual criteria and groups of criteria (end of Table 4). Also, α coefficient was changed between 1, 2, and 5. The Borda method gave an explicitly unmistakable solution, similar to the BATNEEC options applied above. The most advantageous appeared to be the dry single-stage technology. The result obtained by the Borda method did not depend on preferences of a decision-making person. Meanwhile, the compromise programming method gave a more complex outcome, as there was a possibility of different “weighting” assignments to separate criteria. In all cases, similar to the above, the most advantageous technology chosen was the dry single-stage one. It has to be admitted that both technological solutions had similar assessments in the ranking, and differences in the technology assessments were small. In the section above, where the BATNEEC criteria were scored using a 10-point scale, the differences in the assessment of the technologies were more expressed; consequently, it was possible to isolate nearby solutions and reach firm ground to claim that both technological solutions acquired similar assessments. A difference of one point in the assessment gave a very high difference in multi-criteria analysis. In conclusion, ranking of the technological solutions indicated that the dry single-stage method of STPP production was the advantageous technological variant. The third method applied was AHP, with the use of the HIPRE program (Hämäläinen and Kettunen 1994; Salo and Hämäläinen 1995). Figure 2 illustrates “a hierarchical value tree” built up of variants of technology and assessment criteria for STPP production (Saaty 2001; Larrodé et al. 2012). In the proposed AHP method, there was a possibility to assign “weightings” for each group of criteria and for criterion by themselves. In the example presented below, groups of criteria underwent, in turn, outweighing. 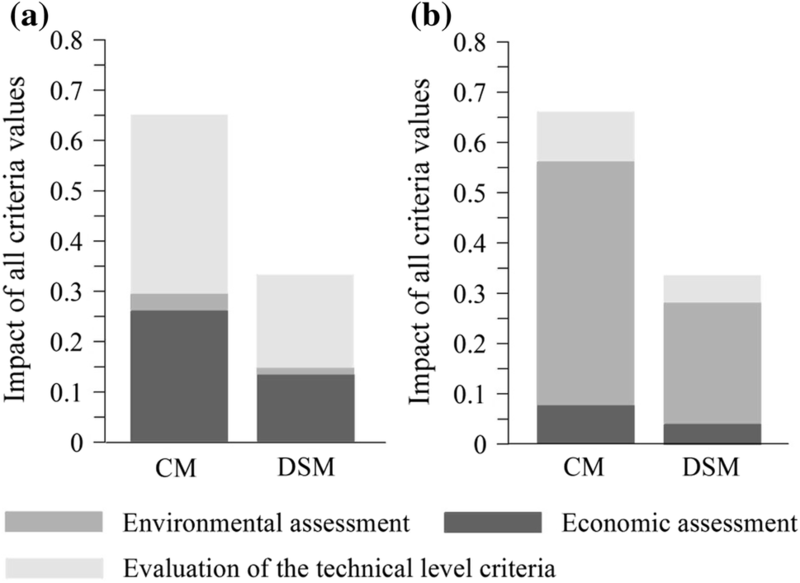 Figure 3a–c demonstrates results of multi-criteria analysis (AHP) after significant outweighings of technical, environmental, and economic criteria, respectively. Figure 3a presents the result of calculations where the “weightings” of technical, economic, and environmental criteria were 0.788, 0.046, and 0.165, respectively. Figure 3b illustrates the result of calculations after economic criteria were outweighed and the ratio of “weightings” amounted to 0.042, 0.778, and 0.18, while Fig. 3c presents results of ordering variants for “weightings” of 0.097, 0.086, and 0.818. In each of the analyzed cases, the dry single-stage method was again chosen as more advantageous than the classic method of STPP production. Figure 3a–c demonstrates that a predominance of the environmental “weighting” criterion gave a higher result for the dry single-stage method. Also, a predominance of the technical or economic criterion gave a more profitable final result in the case of the dry single-stage method. However, the classic method gave very close results and ordering, particularly in the case of predominance of the technical criterion. Application of the AHP method enables performance of sensitivity analysis by analyzing the result through a change in “weighting” of a selected criterion, while the “weightings” of the other criteria remain unchanged. Figure 4a–c demonstrates an example of sensitivity analysis in the case where environmental criteria were significantly outweighed. As can be seen in Fig. 4a, b, only a similar shift in “weightings” of technical and economic criteria from a very low number to about 0.9 could change the ordering sequence in a way that the classic method could be selected as more advantageous than the dry single-stage method. Meanwhile, in the case of the environmental criteria group, a shift of the “weighting” values toward very low ones (about 0.2) could change solutions and ordering. Figure 5a, b illustrates results of multi-criteria analysis (AHP) after significant outweighing of the “weightings” in groups of criteria. These were assigned to the technical and economic criteria groups simultaneously (Fig. 5a) and to environmental criteria separately (Fig. 5b). In all those cases, the dry single-stage method was chosen as significantly more advantageous than the classic method of STPP production. Results of AHP analysis are presented in Table 5. The results obtained by the AHP method, specified in Table 4, confirm the conclusions from the Borda and compromise programming methods. From the figures, it can also be concluded that values of the assessment were not changing. The only changes that could be observed were changes in relationships between “weightings” of criteria groups. Sensitivity analysis performed with the use of the HIPRE program confirmed the results of multi-criteria analysis. With indices of technological quality setup, the ranking of technological variants of STPP production did not change depending on the hierarchy of criteria validity. Results obtained from AHP analysis confirmed the results obtained with the use of Borda and compromise programming methods. Multi-criteria analysis allowed for choosing the dry single-stage method of STPP production as the most advantageous technology variant. Multi-criteria analysis using an assessment of particular BATNEEC options and indices for complex quality assessment as criteria of STPP production made it possible to write a decision matrix for the choice of technology according to the following decision methods: Borda, compromise programming, and analytical hierarch process (AHP). The use of various criteria types (BATNEEC options and indices for complex quality assessment) as evaluation criteria in multi-criteria analysis allowed for an independent evaluation of the technology. Calculations from Borda and compromise programming methods showed that, in all cases, the assessment criteria used reached the highest possible level for dry single-stage technology (DSM) for STPP production. The classic technology (CM) of STPP production was not indicated by any assessment method as the superior choice. Results obtained by AHP method confirmed the conclusions from Borda and compromise programming methods. It has to be admitted that both technological solutions gave similar assessments in the ranking, and differences in the technology assessments were low. In conclusion, ranking of the worked out technological solutions indicated the dry single-stage method of STPP production as the advantageous technological variant. This work was supported by the National Science Centre Poland (Grant Number N N209 088840).